Bed bugs feed on human and animal blood. Bed bugs don’t need to eat for several months. Bed bugs are often confused with other insects, especially fleas. Bed bugs can transmit several diseases to both humans and animals. Bed bugs can be found throughout each state in the U.S. Bed bugs are generally active at night. Bed bugs live in kitchens near sugary foods and pasta. Bed bugs are easy to treat. Bed bugs can lay up to 100 eggs each day. After a bed bug eats, it changes from brown to a red or purplish color. Before we get to the answers below, take a minute to learn a few additional facts about the life cycle of bed bugs. Female bed bugs mate and lay tiny white, oval-shaped eggs in small crevices. Estimates vary, but females can lay up to 250-500 eggs in a lifetime. After 6-10 days, the eggs hatch and small nymphs emerge. They seek food blood from animals or humans. Nymphs molt their exoskeleton five times during their growth. The nymph typically stays in each of these five growth stages for a week or more. While growing, nymphs can feed as little as once every few weeks or as often as every day. Each feeding takes 5-10 minutes and is usually done at night when animals or humans are sleeping. Older nymphs can survive several months without food. Although estimates vary, the life span of adult bed bugs ranges from 4-12 months. Now, let’s get back to the answers to our bed bug quiz. 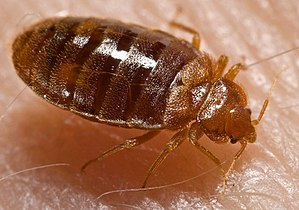 Bed bugs can transmit several diseases to both humans and animals. False. While bed bugs may seem gross for several reasons, they don’t actually transmit diseases. Bed bugs live in kitchens near sugary foods and pasta. False. Bed bugs live near people and animals, often in bedrooms. Bed bugs are easy to treat. False. Bed bugs are very difficult to eliminate and usually require a professional pest removal service. Bed bugs can lay up to 100 eggs each day. False. Thank goodness they only lay 1-5 eggs/day. Florida Pest Control Center (FPCC) pest removal experts, also known as “America’s bed bug whisperer” company, sets the standard for pest control service with residential, commercial and industrial customers. In fact, our non-exclusive access to the University of Florida’s urban pest management and modern pest control technology experts enables us to customize the most effective treatment plans for every situation. We employ comprehensive, state-of-the art technologies, chemical, and non-chemical treatments to eliminate pest problems. Our highly trained professionals are knowledgeable, discrete and thorough, providing a fast, complete solution to your pest issue. Florida Pest Control Center (FPCC) services are licensed, insured, and guaranteed. Safe. We use the safest treatments available. Easy. We make it as easy as we can on you and your family. Effective. Our treatments will effectively remove bed bugs from your home. Will the Real Sugar Ant Please Stand Up? And Leave! © 2018 Copyright Florida Pest Control Center. All Rights Reserved.